Golf course - ours just opened back home! Once I go under the bridge in front of me the current gets real tough. I begin bike portaging soon. Plans were to enter the Grand River here, but I changed my mind! Picture of lunch at English Inn. As I took this picture I ran into a logjam and had to free myself and portage around it. Karen, Coach, Jim, Nancy & Jim Jr.
Pat Paquette meeting me at Tunnel Park. Pat is a former student and football player. Back in Eaton Rapids with my fellow paddlers. I started re-doing the section from English Inn to Dimondale with them. Pat Harrington and Robin Barfoot with my bike. Pat took it home and cleaned and serviced it for me! The man said, “Glad to meet you. My name is Jim Woodruff. I’m the topologist for this adventure". Jim said something like, “Get out of water for gosh sakes. You’re in Michigan. Put some boots on!” I only have sandals with me and was standing in about a foot of water. I told him I was from Superior, WI and this was like mid-summer. That set the tone for the evening. Jim Woodruff is 87 years old and a long time friend of Verlen Kruger. I’ve mentioned in an earlier posting that he’s the originator of the Heward Challenge and has done a tremendous amount of research on Heward’s voyage across Michigan to Chicago. For the Kruger Memorial Project, Jim is also tracking and updating the progress of the Intrepid 4: Dan, Mark, Charlie, Toby and also Jon Holm the young man I paddled with when we started out. What is also unique is that in his blog, Jim correlates the original Heward journey timeline with the current progress of the paddlers behind me. The trip was starting out just a little too smoothly for my liking. I'd already had my gear put together two days in advance rather than an hour before leaving and most of the honey-do list was done. Just didn't feel right being so prepared. Anyway, at 9:00 AM, after saying my goodbyes, I headed down the driveway only to turn around about a mile down the road and head back to the house. Half hour later, after searching all over the house, my mother-in-law who's 94, found my glasses and I started out again! Thanks Glenys! Things were getting back to normal real quick. First stop, bank in Solon Springs for some cash. Quickly done and I was off again only to stop for gas in Minong and realize I left my credit card in the ATM back in Solon. A mad dash back! No credit card in machine. Went into the bank with the hope it was turned in. Found out something I never knew before - that if you do not take your credit card from an ATM the machine will either pull it back in to store it or shred it. Fortunately, in banks it is stored. Thank you very much! So, now that I've forgotten a couple of things already, things really are back to normal and I feel a lot better. Hopefully when I get to Detroit I still have my canoe and paddles! The rest of the trip to Racine, WI where I'm meeting my friend, Jim McIntyre who's taking me to Detroit, went smoothly. I even made a couple of bucks at the casino near Black River Falls, WI! Tomorrow, Thursday, Jim and I will head to Detroit where I will hook up with 7 others who plan to do this challenge starting on Friday at 8:30 in the morning. The challenge is actually a fundraiser for The Verlen Kruger Memorial which is being built in Portland, Michigan along the Grand River, which is one of the rivers we will be paddling. Verlen is considered the guru when it comes to long distance paddling. It is a Kruger canoe which he designed that I used to paddle from the Atlantic to the Pacific and will be using on this trip. So, it is in honor and memory of Verlen that I decided to participate in "The Hugh Heward Challenge" in the hope I can be of some help in drawing awareness to the project so the many friends of Verlen's will in the near future see the memorial become a realiy. Hopefully this will give all that follow my journey a good background. Note: I will attempt to post journal entries as often as possible and hope to post the first day's paddle this coming Saturday or Sunday. Jim and I arrived in Detroit, actually St. Clair Shore, where we met the others who plan to do this challenge for dinner. Dan Smith is from Portland, MI and was a very close friend of Verlin Kruger and the person who's heading up the Verlin Kruger Memorial Park. I met Dan the year before I started my Atlantic to Pacific trek. On a football clinic trip the spring of 2005 I stopped to see Dan and get info on the Kruger Canoe. He was very helpful and shared numerous stories about canoeing and Verlin Kruger. Mark Prezdwojewski was also there. He was Verlen Kruger's apprentice for many years and upon his death took over and continues to build the Kruger Canoe. I actually bought number 213 from him in 2005. Great young man and a very accomplished paddler. From what I heard and seen he's doing an excellent job in carrying on the canoe legacy of Verlen. The rest at dinner were Charlie Parmalee who did this challenge last year and Toby Nipper, who came all the way from Florida to do the challenge. Others not doing the challenge were Bob Bradford, Mel Herrera and Gloria Kelly. Mel bought dinner for everyone. Thanks Mel. All except Jim and I were camping out at Mel and Gloria's home. By Jim's request our camping spot was the Red Roof Inn. As you can imagine there was a lot of excitement and lot of stories. I sat back and listened, thinking this Kruger guy had to be a special person to have these friends come together and there will be more as we go on this journey and paddle 400 and some miles in his memory. For now I'm the outsider, but hopefully tomorrow I will start to earn their friendship too. Jim and I were up at 5:30 and as always I was rarin' to go. We met the same crew from last night for breakfast at 6:30 and then proceeded to caravan four vehicles to Belle Isle, our starting point, where we will meet the rest of the paddling crew. We arrived at about 8:00 and most of the rest of the paddlers were there waiting for us. After quick greetings everyone scurried to unload and get ready for the push-off. Following pictures, we were on the water officially at 9:00 a.m. Eastern time. The group included Mark Prezdwojeski, Dan Smith, Charlie Parmalee, Toby Nipper, Ron Dean, Bryan Taylor, Chuck Amboy, Jon Holm and me. After more pictures were taken from the shore, we eventually headed down the Detroit River close to 9:30. As we headed out Dan and Mark were side by side just in front of the rest of us. I was thinking "Just the way it should be." Dan heads up the Kruger Memorial Park and Mark, once Verlen's apprentice, now owns and continues to build Kruger Canoes. All but two of us are paddling Krugers. The other two are in kayaks. Before long I found myself paddling next to Jon Holm, in one of the kayaks, who is from Lowell, MI and owns an outdoor sporting goods business. For most of the morning we paddled side by side sharing stories. He is in his early forties and shares many qualities that I see in my own children. As we paddled, I asked many questions about the area and it basically boiled down to that we are seeing the Detroit River from its best view. Paddling the Detroit River reminded me a lot of paddling the Ohio. Very similar, especially around the Cincinnatti area, with cities on both sides of the river. In this case, Detroit on the U.S. side and Windsor on the Canadian side. About an hour into our paddle, Jon and I were now out in front and I asked if he could see how close the others were. He looked back and said they were not very close. Jon had similar plans as I. The main group of Mark, Dan, Charlie and Toby are planning to take three weeks to do this trip. Jon was thinking more like myself - twelve to fifteen days. So we discussed possibly staying together for the trip. I just smiled, for it seemed like he was paddling very smoothly and I not quite but close to being at my maximum comfort paddling stroke. In other words I had about half a gear left and Jon looked like he had a couple of gears to go. Late in the morning we came to a small island where we had a choice of going around it from either direction. I decided to go to the right, Jon decided to go on the left side of it, where he had plans to stop at a little park at the far end. I told him "You will probably get there before me but I might not be ready to stop yet. I'm sure you will catch me somewhere down the river." Of course, once he went his way and I went mine, the competitive juices kicked in and I picked up my stroke, hoping to at least be close to meeting him at the other end. To my surprise at the far end of the island I could not see Jon yet so I anticipated my way was much shorter and continued on. With all the fishing boats around I assured myself that Jon would not be in any danger. Lake Erie is a tremendous walleye resource and this is spawning season for walleyes and there are fishing boats in the Detroit River by the hundreds. I'm been finding myself weaving in and out of them all morning. So I continued on my way expecting to see Jon sometime in the afternoon. I continued to paddle and around 2:30 p.m. I started looking for the mouth of the Huron River. I made a couple of wrong turns. I asked bank fishermen a couple of times if they knew where the river was but no-one spoke English. For a minute I thought I might have gone a little bit too far. I did finally find the mouth at around 3:15. For the last hour or so I was out of the Detroit River and on the shore of Lake Erie and the waves were picking up. Now that I'm on the Huron the water is much calmer and not much current. I expected more. This changed quickly. Just as I paddled under the I-85 bridge the river narrowed and the current really picked up. Before, I was thinking I was easily going to make my day's destination to Willow Metropark but now I wasn't sure. At about 6:30 p.m. I was getting close to my first portage at Flat Rock Dam but at the same time I was paddling less than a mile an hour it seemed. I hadn't been out of the canoe yet today when I decided to pull into a little opening next to a church. There a gentleman and a lady helped me get my gear out of the water so I could get to the other side of the dam. I really appreciated the help. For some reason my body wasn't responding to nine and a half straight hours of paddling. Once on the other side of the dam I decided to continue bike portaging because it was getting late and my body needed the break and peddling felt good. Well,,,I was biking further than I was expecting to and finally found the place where I could get back in the water over a bank. Once on the river it was now dark, close to 9:00 and I found a mudflat on the right side of the river where I pulled in for the night. I stretched out a tarp for my sleeping bag and lay there thinking about the day. I had done way more than I expected. I'm now thinking I'm not going to see the rest of the group until we hook up for the 50-Mile Challenge from Dimondale to Portland on April 25. This has been an annual challenge in memory of Verlen, and Dan and Mark's plans are to be at Dimondale on the 24th. My plans were and are to skip this part when I get to Dimondale and continue on till the 24th, when I come back to canoe the challenge with the group. I realize this river is going to be tougher than I expected with the current. I have my bike portaging system. Everyone else only has portaging wheels which means they will be walking around dams and any water that could be too hard to paddle. Now I understand why Mark and Dan planned for three weeks rather than the two I felt it would take. One good thing is before I left Belle Isle, Dan gave me a very good detailed map of the Huron River showing portages, dangerous water, etc. All I had was a road map. Needless to say this was not going to help me much. Time for bed. I'm whipped. Note: I was finally able to write this three days into the journey at Dexter. Hopefully once I get to Portland, MI in two days, I will have another chance to update. All is going well. Falling asleep last night, I ached so much I wondered if I could really complete this trip. Then this morning I woke up feeling great. Took my dip in the river and got ready to go. Last night when I camped I wasn't sure exactly where I was. After looking at the map Dan gave me I believe I'm somewhere close to the Lower Huron Metropark. As I paddled, I soon came upon a pullout for the French Landing portage, the dam between the Lower Huron and Belleville Lake. Again I'm not sure I came out at the right spot. This was a little bit of a trek to get around this dam and I'm thinking of the guys behind me who will have to pull their canoes and gear this far without the bike system I have. Now that I'm on Belleville Lake, the river will be dammed up a lot between here and Ann Arbor so I will be getting out numerous times. The good news is the series of lakes have little current in them so the paddling will be much easier. So I'm figuring today's paddle will be much easier. As I continued to cross Belleville Lake, I was amazed at how beautiful the homes were on both sides. This continued all the way along. I paddled across Belleville Lake with ease but once the lake narrowed back to a river the current became a little stronger as I approached Ford Dam and then Ford Lake, both named for President Ford who was from Grand Rapids, MI. This portage was relatively easy - out of a beautiful hydro park, over a highway and right down to Ford Lake. Back on the water again, Ford Lake was another beautiful paddle. At the far end I took a picture of a real beautiful golf course which reminded me that our course back home opened up last Friday which means my golfing buddies are getting a head start on me. I'm sure because of that they will give me a few strokes per nine when I get back. I went underneath the I-94 bridge and now I'm starting to get back into the river and the current is picking up. I passed under Congress Bridge with a number of people on top fishing with lines in the water. They couldn't tell I was coming through so I was careful not to hit any of the lines which accomplished. Once getting past the bridge, I looked back to see if I had snagged a line and the canoe went sideways. I'd just hit a small rapids and had to move quickly to get my canoe under control. As I proceeded upstream, the current got stronger and stronger and of course I'm getting slower. At one point a fisherman on the bank hollared at me - "It looks like you're going backwards". I took a quick glance at the bank and realized I surely wasn't going forwards even though I was paddling as hard as I could. I still was a little ways from Peninsular Dam portage but found a little spot on the left where I could maneuver over and pull out. Once on land I was in somewhat of a woods but I could see an opening above which turned out to be a little park. So I loaded everything onto my bike trailer and pulled everything up to the park. Looking at my map, I saw I was close to Huron River Drive in Ypsilanti so I knew I was able to bike to the next portage. As I'm biking down Huron Drive, I did not see the dam right away until I got past it. I looked down and saw no portage so I thought it must be ahead a little bit so I kept riding. Soon I came to another dam but the river was a ways away and again I did not see any portage so I continued down Huron Drive. Soon I came to a third dam. Did not see the portage so the decision was made to continue as I was now at the outskirts of Ann Arbor. Ended up pedaling through Ann Arbor until I got to the far end of Ann Arbor and Barton Pond. Here I was able to get back in and paddle for the rest of the afternoon until I got to a bridge where Barton Pond again became the river. At this point it was like when I had to get out earlier at Ypsilanti. There was no way I could make any progress. There was a small canoe landing here so I pulled in and checked my maps and realized I'm back near Huron River Drive and that the road followed the river all the way to Dexter. It was getting late so I felt it was a good time to get out and follow Huron River Drive to find a good place to camp for the night. As I'm peddling down Huron River Drive I notice the current is very swift and lots of deadfall in the water. From here it looks like it's almost impossible to paddle so I kept going until I found a little cornfield in a place I figured I could tuck in without disturbing anyone for the evening. It was now about 8:00 and time to quit to figure out my next day's strategy. As I lay in my tent, I kept thinking about the people behind me. How difficult this is going to be for them. I've got a feeling they are going to be doing a lot of walking, pullling their canoes and gear behind them through this entire section. My hat goes off to them for I do not know them well but I've got a good feeling they will not give up. For me, I have no clue what I am going to be doing for I no longer have any maps other than a road map. I know that we are to continue to Portage Lake which is about eighteen miles from Dexter, just ahead of me. From there I thought there were supposed to be small rivers that we would follow and a short road portage as we worked our way to the Grand River. For the life of me, as I study my map, I can't figure out how that will happen. Well, time for bed. I'll figure it out in the morning. After studying my map last evening I see the best way for me to get to the Grand River is to bike portage by taking the Island Lake Road to Hwy 52, then Territorial Road to the Grand River. So I packed up and proceeded on my way to Dexter, stopping only long enough for a journal entry and continued on my way on Island Lake Road. Island Lake Road started out as a paved road but quickly turned into a gravel road. Side Note: The best way to explain what it's like to pull a canoe by bike is this. First of all, my bike is a Dahon with 20" wheels and naturally folds up. My bike trailer is basically a T of pipes with 16" wheels. The middle of the canoe sits over the wheels and the front of the canoe ties to the extended pipe that attaches to the bike. There is a V attachment that goes around the pipe that the front of the canoe rests in and allows me to attach it to the trailer. One slight problem I forgot to mention earlier is that on my first portage I could not find the V attachment. Must have left it in Jim's car or back at Belle Isle. At the time I felt I was in deep trouble for I couldn't figure out how I could keep the canoe attached to the trailer. But with the habit of losing things and re-adjusting for many years, I figured out if I take my tiedown strap, wrap it around the pipe and then around the stern of the canoe and cinch it down tight I can create my own V attachment to secure the canoe to the trailer frame. It is working well. If I do say so myself, that's pretty good thinking for a full-blooded Norwegian. Anyway, to give you an idea of what it's like to pull a canoe, it's like having two of your grandchildren sitting in a wagon - both maybe a few pounds overweight - and you are pulling them on this little 20" folding bike through a yard where the grass hasn't been cut for a month. In other words, it's a little bit like paddling upstream but only using your legs. Although I can keep up about a 7-10 mph pace. As I continued on my way, it felt good to be doing something beside paddling. Also I see this state from a different view other than the river. It's very pretty. Very much like my home state of Wisconsin. Lots of farms, rolling hills, and forests. I saw numerous deer and wild turkeys as I pedaled. Around 3:00 in the afternoon it started to rain. I wasn't that far now from the Grand River and decided rather than get real wet I will look for a place to camp. Not much farther down the road, I found what looked like an old abandoned railroad trail. I worked my way down the trail until I was out of sight and set up camp. Snug in my tent with the rain now starting to pick up, it actually felt good to be taking what I call my first real break. Normally it's tough for me to stop before dark but today my body tells me I need the rest. I sure hope the others are OK. It rained most of the night and still is drizzling as I get set to continue on to the Grand River. Sure glad I stopped when I did yesterday for I got my tent set up and everything secure before it really started to come down. Also, it felt good just to relax and reminisce about all that’s transpired since I left Belle Isle in Detroit. Plus, a good night’s sleep is just what the doctor ordered. Once packed, I started for the Grand River, eager to begin paddling with the current rather than fighting it. It took less than 45 minutes to get to the Grand River landing off Dixon Road. River was flooded. All I saw was what looked like a big pond with trees and deadfalls in a tangled mess. I couldn’t really make out a real river. I pondered whether I should enter here, for if this is what I faced I did not want to get tangled up in trees and deadfalls in the middle of nowhere, which I felt could easily happen with the fast current. (Must be getting old, I’m thinking of safety before I act!) So, I decided to move up to the next portage which I was told from talking to a guy earlier was not far away. I forgot the name of the landing I put in at, but it looked a whole lot better than the other, although there were still plenty of deadfalls. It felt good to be back on the river. Current was fast, river was flooded and from the starting point to Eaton Rapids, many times I found myself weaving in and out of trees and deadfalls. At times I felt I missed a turn and was lost in a bayou. As I paddled into Eaton Rapids I was looking for a take-out spot as I approached a dam I needed to portage around. I passed a boat landing back aways, but figured there had to be one closer to the dam. I was wrong. All I found were homes and private property. I was thinking to myself, shucks, I have to turn around and go back. Nothing bothers me more than backtracking. Just then I spotted a man cleaning up his yard on the other side of the river not far from the dam. I thought, heck it’s worth a try, maybe he’ll let me cross his property. Darren Tanner, a young man who’d just bought the home and property was more than happy to allow me to portage across his land once he heard what I was doing. As many have in the past, he seemed bewildered as I put my bike portaging system together and told some of my story. It was getting close to 2:00 as I re-entered the water and head to Dimondale. It’s at Dimondale I’m leaving the water and moving up to Portland, MI. Dimondale is the starting point for the 50 mile Hugh Heward Challenge which is being held next Saturday, the 25th of April. My plan is to come back to do this then, for this is the big event for the Kruger Memorial Project and I do not want to miss it. So, I will continue on from Portland and return in the afternoon on the 24th to Dimondale. Karen Stock, the daughter of Jim Woodruff who’s tracking and blogging this event for the Kruger Memorial Project has arranged for her brother to meet me at Dimondale and shuttle me to Portland. I made phone contact with Karen as I left Eaton Rapids and she told me her brother would be there. She said that she and her Dad will be coming down also to meet me and hoped I’d join them for dinner once we got back to Portland. The trip from Eaton Rapids to Dimondale was much the same as the previous - in and out of deadfalls and twice portaging around river logjams. I arrived at Dimondale around 5:00 and called Karen and found out they were only a couple of minutes away. The first day’s journey on the Grand River is over, but the day’s adventure is not. As I paddled over to the park in Dimondale, I saw a couple of cars pull up. Two ladies and an elderly man (sorry, Jim) were coming toward me waving and telling me to wave back as they took pictures. When I reached the shore, Karen was there with her dad, and said, “This guy has been waiting to meet you.” The man said, “Glad to meet you. My name is Jim Woodruff. I’m the topologist for this adventure". I said, “Hi, I’m Larry Hoff. They call me Coach.” Jim said something like, “Get out of water for gosh sakes. You’re in Michigan. Put some boots on!” I only have sandals with me and was standing in about a foot of water. I told him I was from Superior, WI and this was like mid-summer. That set the tone for the evening. Jim Woodruff is 87 years old and a long time friend of Verlen Kruger. 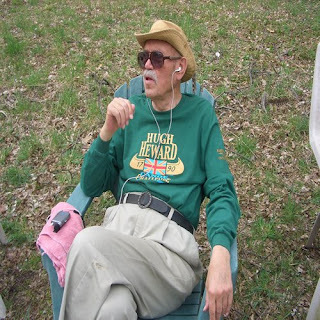 I’ve mentioned in an earlier posting that he’s the originator of the Heward Challenge and has done a tremendous amount of research on Heward’s voyage across Michigan to Chicago. For the Kruger Memorial Project, Jim is also tracking and updating the progress of the Intrepid 4: Dan, Mark, Charlie, Toby and also Jon Holm the young man I paddled with when we started out. What is also unique is that in his blog, Jim correlates the original Heward journey timeline with the current progress of the paddlers behind me. You can also find information on the trip on the Kruger Canoes blog at www.krugercanoes.blogspot.com. I encourage you to check both websites as they have lots of pictures, slideshows and good accounts of the paddling. Soon Jim Woodruff Jr. showed up and we quickly packed my gear in the cars and loaded my canoe on Jim Jr.’s car and off we went to Portland, MI. I rode with Nancy Anderson, who a very avid canoeist and outdoors person. She was visiting Jim this day and decided to come along. Very nice person and did Jim’s transcribing for his Hugh Heward book. We had a very nice conversation as we rode back to Portland. At Portland we made a quick stop at Jim’s home along the Grand River. Jim took me inside and showed me his office where he does all his writing. Very impressive. He also took me out on his deck, pointed to a telephone pole in line with a big fir tree crossing the Grand River and pointed to a bluff on the other side. He said “That is where Verlen is buried.” You could see the pride in his eyes for the man he loved so dearly. We then drove on to Portland with a quick stop at the Best Western so I could get a room for the evening and then drove to a local restaurant for dinner. What a beautiful evening! Story after story. Jim telling his, I telling a few of mine, learning that Jim Jr. does a lot of biking and did a big trip in Europe not too long ago. Karen was a woman in her fifties but you couldn’t tell it. She’d gone out of her way to see that I got from Portland to here. I cannot express how grateful I am. As the evening went on it became quite clear that Karen and Jim are very proud of their father and rightfully so. I know Karen is also going to post some pictures and comments about this evening on Jim’s blog, so if interested you might check out his website. Thanks for a great evening, Jim, Jim Jr., Karen and Nancy. Looking forward to seeing you again this coming weekend. I woke and saw that it was light out. I thought to myself, "Man, I'm late. I gotta get going!". Then I realized I was in a motel room and didn't need to go anywhere. It was 8:30 and I was still in bed. I must have really needed this rest for normally I'm awake before sun-up. I took my time getting everything together so it was still cold and raining out. By the way, I forgot to mention yesterday it was cold and rainy most of the trip. For the first time, I used the skirt on my canoe. The skirt is similar to what you see on a kayak. It surrounds my entire body and allows no water to get into the canoe. I felt like a bug snug in a rug. It also keeps my lower body warm and with a rain jacket it's like being in my own little home. I paddled all the way across the country a couple of years ago and never took the time to see how this works. Now I sure wish I had for it would have kept me from bailing water out of my canoe day after day. Just like me - takes too much time to test things out. Oh well, the world is still spinning. I was just getting ready to take things down to my canoe when the telephone rings. Chuck Amboy was one of the day paddlers that started out with us from Belle Isle. He and the other day paddlers went as far as the mouth of the Huron River. He called to tell me that he had some good pictures and wondered how he could get them to me. Also that Friday before the 50 Mile Heward Challenge there will be a dinner in Dimondale for the paddlers. He wanted me to know that if there was anything he could do for me, he was willing to help. I really felt this was a nice gesture. Thanks, Chuck. I will see you next Saturday. Not long after, Mike Leyrer called. He is part of the Kruger Memorial Project and lives in Portland. Wanted to know if there was anything he could do to help me get started this morning. He offered to show me the options to get back in the water and give me a tour of the town of Portland. I took him up on his offer and the two of us took about a half hour just riding around. Very interesting man, and very helpful. The pride and respect he feels for Verlen and the memorial project comes through loud and clear. Mike brought me back to the motel. He was amazed at how light I was traveling. Actually, I thought I was traveling pretty heavy. He also was very interested in my little 20" bike and my trailer set-up. I told him I was fortunate to walk the Pacific Crest Trail, where you had to go light and this has carried over to everything I have done since. I said the key for going light is never carry anything with you that you do not use every day, other than making sure you are prepared for the elements. I said my goodbyes to Mike only to see him again at the first dam portage just outside Portland. For all his good intentions to show me the options I had to get in the water, as I rode my bike down the bike trail next to the Grand River, I missed every one of them and ended up on the outskirts of town. Stopping for a minute to figure out where I was, a man came by and asked me if I was looking for the river. I said "I think I missed the landing". He said "Yes, it's back in mid-town". Now knowing I don't turn around, I asked him "How do I get to the dam?" He gave me directions so off I went. As I was unloading at the dam, Mike pulls up. I told him with all the great instructions you gave me, I still screwed up. He chuckled, helped me unload and I was on my way. He told me that Dan Smith's brother Scott would be down the river at the first bridge I came to and wanted me to say hello when I got there. Before I left, I asked Mike how long it would take me to get to Scott. He said he wasn't sure but maybe an hour. I got there in just a little over half an hour for the river was fast. Scott was standing on a bank with a trailer filled with canoes and a big smile on his face. I pulled in. We introduced ourselves to each other and I asked if I could take a picture of him next to his canoes. He said yes and if I wanted to, I could come up and see his shop, which was less than a mile away. I jumped at the chance for I was very interested in seeing the step by step process of canoe building. Scott took me back to the water. I said goodbye and look forward to seeing him again at the 50 mile challenge. The rest of the day was spent paddling in and out of rain, sleet and snow. It was a lot like being in the Boundary Waters. Cold, miserable and enjoying every minute of it. I ended up somewhere past the dam at Lyons before I made camp. As I tucked in for the night I hoped that tomorrow brought a little bit more warmth and that the rain would be over. Two and a half days of this is enough. Plus I miss seeing the Big Dipper. By the way, a couple of times on this journey I've been asked what the Big Dipper represents on my website. Thought I'd take this time to explain. A few things have changed since I wrote the entry below for my Pacific Crest Trail journal back in 2003. My mother has passed away. I have two more grandchildren, Ryah and Avery. And of course, many more friends, including the ones I'm meeting on this journey. I believe this is the coldest night I've spent. I didn't jump in the river this morning. I camped somewhere below Lyons and got started as quickly as possible, if for no other reason than to get warmed up. Basically today was just a non-eventful day of paddling until I got to Grand Rapids. Just past the dam was an entry point that according to a guy I met is called the kayak slide. Basically it was just a newly built ramp to the water directly below the dam where there were still significant rapids. At first I wasn't sure if I should even enter, but then I said "What the heck". A little tricky getting back in the canoe but this canoe just doesn't tip. Once on my way I just sailed through the rapids with ease. I continued down through Grand Rapids and about 8:30 made camp somewhere on the outskirts of the city. Good day of paddling but I sure hope it warms up tomorrow. I heard it is supposed to. Time for bed. With thoughts of making it to Lake Michigan tomorrow. Woke up today still cold but at least it's bright skies. I'm figuring approximately 40/45 miles to Grand Haven and the entry point to Lake Michigan. Also figure it's a 3-Advil day in order to do it. Took my time today, sort of hoping for the weather to warm up and lay in my tent and didn't get in the water until well after 8:00. No wind at all today and still had excellent current and made great time. I paddled until noon when I saw on river right (this is a new term I've learned on this journey -"river right" or "river left" - I used to call it the left or right side of the river) a sandy beach with a nice grassy knoll above it. I thought "Heck, I haven't taken a real break except for portages. I think I'm going to stop for lunch", which I did. I spent a good 15 - 20 minutes, which is unusual but it felt good. I continued paddling on to Grand Haven, with the thoughts that I not only need to get to Grand Haven but I need to get as close to Holland as possible. Pat Paquette, who played football for me back in the 70s, now lives in the Holland area and has offered to drive me back to Dimondale tomorrow for the 50 mile Challenge, which is being held on Saturday. This challenge is very important to me, which I will explain in a later post. I continued on my way and at about 2:00 I thought I was getting real close to Grand Haven, which was hard to believe. I didn't think I could be here this quick. It seemed like I had only 5-6 more miles to go. After looking at my map for a change it turns out that I have more like 14 miles to go because of the twists and turns into Grand Haven. Eventually I found myself paddling through the channel heading to the lighthouse at the entry to Lake Michigan and officially turned the corner onto Lake Michigan at 5:03. My thoughts earlier were - will I actually be able to paddle into Lake Michigan? Living near Lake Superior I know how treacherous it can be coming out of a harbor entrance onto a big body of water like Lake Michigan. It doesn't take a lot of wind to make things difficult. As it turned out, luck was on my side once again for there was barely a walleye chop on the water and I was able to make the entry and turn south toward Chicago with ease. I spent some time along the city beach next to the entry taking pictures and checking my maps to see how far it was to Holland. I figured it was approximately 20 miles so I should be able to make Holland by noon tomorrow and decided to set up camp when I could find an isolated spot. Just then, Karen (Jim Woodruff's daughter) called. I told her I would be back for the 5:00PM luncheon, pause,,, she said it was at noon! Old age on my part had set in again! After our conversation I figure I must keep paddling, hoping to make at least another 6 to 8 miles. I finally stopped well after dark, with hope of an early start tomorrow I'd have a chance to make it to Holland by 10:00AM! I believe this is the best mileage day I've had on this trip. Normally I'd feel good about such an effort, but tonight I'm thinking, WHY! I'm now laying in my sleeping bag, looking at the Big Dipper and feeling good to be this far in 7 days. Chicago should be within reach by mid-week if conditions are anywhere like they are today. As I gaze at the stars I'm thinking about the many people who've help me out along the way. Yesterday for example, while portaging in Grand Rapids, two young ladies went out of their way to get me a sandwich. When I hiked the Pacific Crest Trail, hikers called such people, Trail Angels. Now I call them Paddle Angels. THANKS TO ALL! Up very early this morning and on the water well before sun up. Again the water was calm, just a slight breeze from the southeast. A very peaceful paddle all morning. At about 8:30 I noticed what looked liked a park and figured I must be at Tunnel Park in Holland. I pulled over to shore to check it out. At Tunnel Park there's supposed to be a tunnel through the sand dunes and into the park. I saw no tunnel but decided to check it out anyway and walked up and over the sand dunes. Sure enough it was a park so I decided to get out and pulled my canoe and gear up and over the sand dunes. Once on the other side, I found out it was not Tunnel Park but Kirk Park. This meant I still had about 7 or 8 miles to go to Holland. I needed to get to Holland by 10:00 in order to get back to Eaton Rapids for the luncheon by noon. So I hooked up my bike and started pedaling on a very nice bike trail. I arrived at Tunnel Park just before 10:00 and my former football player, Pat Paquette, arrived a short time later. We pack everything up and headed for Eaton Rapids. Pat Paquette is one of the most talented athletes to come out of Superior, WI and that is saying a lot. For I believe Superior still has the most individuals inducted into national hall of fames than any other city. I'm sure that is correct for a town under 50,000 people. Pat played for us in the mid 70's. As a sophomore, he not only started, but was a main factor in us being the number one football team in the state until we stubbed our toe late in the season and lost two games in overtime. That happens in life. Big thing is one must pull themselves up and get after it again, which that team did. We arrived in Eaton Rapids shortly after noon. There must have been 20 plus people at the luncheon including the five paddlers I started with, Toby, Mark, Dan, Charlie and Jon. Great reunion and lots of stories of our journey passed back and forth. Because it was only about 2:00pm I decided to paddle to Dimondale with Toby, Mark, Dan and Charlie. I've done this section already and could ride over but I'd be there with nothing to do. Joining us for the paddle were Nancy Anderson who met me when she came to Dimondale with the Woodruffs, and shuttled me to Portland a few days ago. (There was one more person, who's name I've forgotten.) Just a nice relaxing paddle, sharing conversation with all. At Dimondale we were met by other paddlers doing the 50 miler. Turned out to be a great evening meeting new people including Bob Bradford, his wife, son and nephew. Bob saw us off at the start of our journey back in Detroit. What I did not know then was he and his partner, Clark Eid hold the record for paddling the length of the Mississippi in a time of: 18 days 4 hours and 51 minutes. Unbelieveable! Check it out at: http://www.mississippichallenge.org/ He and his wife will be paddling a Kruger Crusier tomorrow. They are good and will be the first Kruger Canoe to arrive in Portland. His son and nephew will be in a racing canoe and most likely will be the the first racing team to arrive in Portland. Very talented family. I must also mention Pat Harrington and Robin Barfoot were there to help all us paddlers out in any way they could. Pat went beyond the call of duty. He works on bikes and took mine home with him and did a complete service job on it. What did I say about paddle angels, they are unbelievable! Thanks Pat and Robin. A group of us had a great dinner at Mike', up town. Mike plans to open at 5:00 in the morning so whoever wants can have breakfast before we push off. Time for bed. More great friends! Just another great day. My journal is behind by a number of days. Just so everyone knows, I left Lake Michigan last Monday because of high winds and unsafe conditions. I have no experience on big water and made the decision to go home with the hope of returning when Mark, Dan and Toby get to where I left off. They may want to continue by themselves and if that is the case I'd come back later in May when I was better prepared. Last Sunday I ran into some fog when I was cutting across a bay on my way to South Haven. It came up quick and I was about a 1/4 mile from shore and I could barely see it. Also, as I concentrated on getting to shore, I did not see a rolling wave come which would have swamped me if it were not for the skirt covering my canoe. I left the lake at that time, called my friend Jim McIntyre who was still in the area and told him I was off the water and biking. We found a motel later in the day and I told him I'd make a decision in the morning on continuing or not. I have no patience in waiting nor did I want to bike portage, so we headed for home. Today, Thursday, April 30th, Mark called early in the morning and invited me to join them. I quickly called my good friend Jim and told him I was heading back to the water. What a friend! Again, without hesitation, he said he'd take me over. So back to Racine, WI I went. Transferred my gear and canoe to his car and off we went. As I write this, Thursday evening, Jim and I are in a motel just north of Michigan City. Tomorrow morning I will hook up with Dan, Mark and Toby and continue on to Chicago. I sincerely am thankful they are allowing me to join them. Hopefully we finish this adventure as we started, all together. Just the way it should be. I will not be posting entries until we get to Chicago which hopefully is within 3 days. The day started with a group of us going to Mike's at 5:00 for breakfast. By 5:30 in the morning, Nancy Anderson and her crew of volunteers were beginning to set up their registration table. They will be handing out maps for the challenge and collecting the $10.00 fee that goes towards the Verlen Memorial. Last year they had over 80 participants and hope for a hundred or more this year. The Heward Challenge began a number of years ago by another organization (forgot the name) with just a handful of paddlers. In recent years Jim Woodruff (I believe) approached the Kruger Foundation about taking it over and developing it into a fundraiser for their project. They jumped at the chance. The challenge will began approximately at 7:00. There's really no offical start time for it's a challenge against oneself. We will paddle towards Lansing, MI where we will need to portage around two dams. Soon after we come upon Jim Woodruff's home. Jim will be there along with family and friends to greet paddlers as they come by. Many will stop as I will for a visit and thank him for all the effort he's put into this event and so many others. He's an amazing man of 87 and sharp as a tack. As we continue on we will come to one more dam in Grand Ledge, the halfway point. Also, the starting point for canoeists doing the 25 mile challenge. (Some will also join as for the last 10 miles). After the Grand Ledge portage it's clear sailing to Portland where we will finish at the site of the Verlen Kruger Memorial. We will be greeted with three blasts from a horn and applause upon our approach and given much needed food and refeshments. When we got back from breakfast at 6:30 there were people all over and still more coming in. I hustled to get my gear and canoe ready. Because there was no official start time, canoes were starting to enter the water about 10 minutes to seven. Some participants were there to see how fast they could do the 50 miles. Most were there just to enjoy the day. Also, there were a handful of racing canoes, both doubles and singles. They were using this challenge as a warmup for a marathon race later in May. I was told most would be starting about 2 hours behind us and would still beat us to Portland. Hmmmm! Racing canoes are very different than a Kruger Canoe. They are built for speed - long, narrow and light. A Kruger Canoe is built for expedition canoeing - rugged and stable. Although designed to move well in the water, they are no match for a racing canoe or a top of the line kayak for pure speed. I entered the water at about 7:05 and soon found myself paddling with Dan Smith, Toby Nipper and Todd Ceaser. Dan and Toby are two of the canoeists I started with back in Detroit. Mark Przedwojewski is starting later and will be paddling alongside Marissa and Hannah. Brian Weber, Marissa's father, will also be paddling with the girls. Brian asked earlier if Mark would be willing to give advice and tips to the girls as they paddle. Mark, as always on this journey, was more than willing to help. As the morning wore on I found myself mainly paddling with Toby Nipper. We were enjoying the morning at a very comfortable paddle speed when two young guys came by in a canoe and asked if we were going all the way to Portland. Toby said, "We are hoping we can make it." One of the guys said, " Well, you look like you are doing okay paddling and if you keep it up you should make it". This set the tone for the rest of the day. What was going to be just an easy paddle to Portland quickly turned into...okay, let's see how fast I can get there. Even though I was on a mission I did meet and chat with many people on my way. Just past Lansing, I stopped at Jim Woodruff''s home. He was sitting in a lawn chair next to the river, greeting everyone as they went by. Many stopped as I did. I signed Jim's guest book, chatted for awhile and went on my way. Later I started to see more canoes and kayaks in front of me as some paddlers were doing the 25 mile challenge while others were paddling the last 10 miles. As I paddled by many asked who I was and I would answer, "They call me Coach." "Coach", they would say, "You're the one with the fold-up bike! Glad to meet you Coach." Felt good to hear that. At 3:38 I arrived in Portland at the site of the future Verlen Kruger Memorial. It's a beautiful spot along the river. Already they have a small pavillion up and the boulder in place where soon a bronze statue of Verlen Kruger will face the river. There were people all over and lots of food to eat. As a paddler approached, someone would announce his or her arrival by blowing a horn with much clapping and lots of handshakes. All in all over 100 paddlers took part in this Challenge. Very impressive, for it was not the greatest of days - it rained hard most of the atfternoon. But nothing could take away from the pride everyone felt in not only accomplishing the challenge but more important - raising money for the memorial. Later, Jim Woodfruff arrived with his son and daughter. He handed me a Hugh Heward shirt with a big smile while his daughter took our picture. I left very touched and honored. Now I could finish what I'd set out to do. I'd just completed the Hugh Heward 50 Mile Challenge and still had the remainder of the Ultimate Challenge to go. But purchasing a brick that will be part of the Verlen Kruger Memorial was the main goal for this trip. Note: By the way, not all the racing canoes beat me to Portland! Yesterday my good friend Jim Mc Intyre again drove all the way from Racine, WI to pick me up after the 50-Mile Challenge and take me back to Saugatuck, MI. I called Pat Paquette and told him we were on our way. Pat gave us directions to Spectators Bar and Grill. Once there, Pat treated us to one of the best steak dinners I've every had. What a nice place! Lots of room both at the bar and for dinner, plus a beautiful outdoor patio. Very clean and a great atmosphere. If you are ever out this way I wholeheartedly suggest you stop. Plus, Saugatuck is a beautiful little community and worth visiting. Not only could we not pay for dinner, Pat had a room reserved for us at the Best Western. Can not thank him enough, for a good shower and nice bed was just what the doctor ordered. Pat met us in the morning for breakfast with his business partner Clair and his son Alex. After breakfast he gave us a tour of the town and showed us the new football complex which was state of the art with synthetic turf and track. Unbelievable facility for such a small community. It was now time to get back in the water so we drove down to the beach. Took a bunch of pictures and said my goodbyes to Pat and Alex. Jim was going to find a semi-pro baseball game to watch and catch up with me in a day or so. I'd stay in contact by cell phone with him. What was just great was to see Pat and his son Alex again. He's done well for himself and again has made an old coach feel very proud. When I pushed off from shore it was just beginning to rain and rain it did. It poured off and on for most of the day. Although I was snug in my canoe with the canoe skirt around me so no water could get in, it still made it a miserable paddle. Once when I crossed a bay and was some distance from shore, fog set in (see picture) and made it difficult to see the shore. This could have been a problem if it had stayed for I had no compass. In fact as I was concentrating on the shoreline a rolling wave that I did not see hit me and I thought I was about to flip. Not a good situation, but a lesson learned. I continued to paddle until about 3:00PM. The wind was picking up which with the rain continued to make things miserable. I've been in this situation many times and did not mind it. In fact I usually enjoyed the challenge, but today was different. My heart was not into it. Maybe it was the feeling that I'd had last evening as Jim and I drove back from Portland. I felt I'd accomplished what I wanted to and from here on it was all anticlimactic. Maybe I just did not like paddling big open water for all you see all day long is the same sight, water. Mostly I think it was my thought that I should be finishing this with the paddlers I'd started with, Dan Smith, Mark Prezdwojewski and Toby Nipper. They were still about 3 to 4 days behind me and if I continue there's no chance of them catching up, even if I did lollygag a little, which is hard for me to do. Whatever it was I decided to paddle to shore about a few miles from South Haven and call Jim. There was no real place to pull out and get to a road so I just pulled over and walked up over a mountain of a sand dune. I knocked on a door to see if it was okay if I got out here and used their driveway to get to the highway. Now this was not just your little rambler home along the beach so I was preparing for the answer "no". Instead, when they heard about my journey, the couple (did not get names) was like everyone else - more than willing to help. So I pulled everything up and over the sand dune, put my bike trailer system together to the astonishment of the two and was on my way. I did get hold of Jim and he met me along the road in about an hour. I told him I needed to think about this. Used the excuse that it was too dangerous out there by myself and would make a decision in the morning. Next morning I awoke at 5:00, went outside and walked around thinking about what I should do. Weather was good with no wind so I could easily go, but I just didn't want to. Later, after Jim awoke, we went to breakfast. I told him I would start out again and see how things go. That changed quickly for the winds picked up and the weather report called for hazardous lake winds with no lake travel advised. My decsion was made for me. We headed home. Actually I felt good about this. I will be back. Hopefully I will have the chance to continue with Mark, Dan and Toby in a few days. For days I felt this challenge should be finished with all of us together. Now it's possible, but if they would like to continue on by themselves I would understand. Then I would come back at a later time and finish, which I must do one way or the other. Time to get out of here before I change my mind again! Yes! Mark Przedwojewski called early yesterday morning, inviting me to join them. He assured me that they would love to have me join them. So, a quick call to Jim and I was off to Racine. And once again Jim would shuttle me back. Plan was to meet them this morning (Friday) at Van Buren State Park about 5 miles or so from where I left the lake. We were at the Park at about 7:30 in the morning. I had everything ready. I figured that when they arrived they would not want to stop but just have me join them as they paddled by. In about 45 minutes I could see them coming. I thanked Jim once again and told him I would see him in Chicago in three or four days. I was right. It was too early for them to stop, so I quickly jumped into my canoe and joined them. It felt good to be back on the water, especially knowing I'd be finishing with the group I started with. We battled some rain and fairly strong winds in our faces all morning, which slowed our pace to about less than two miles an hour, according to Toby's GPS tracker. Just after noon we arrived at St Joseph, MI. I was paddling a little ahead of Toby when I noticed he was heading to shore. Not quite sure what he was doing, I stayed where I was until I noticed Dan and Mark doing the same thing, so I paddled back. Sail time! The wind had switched and now was slightly quartering us from the northwest. I had never seen a sail used on a canoe, yet alone done this, so I was all eyes. Mark and Toby would be sailing by themselves. Dan and I would catamaran together for I had no sail and would rely on Dan's. Very interesting set-up. Verlen Kruger designed this craft to allow for sailing. In order to do it you need to be catamaraned together or have outriggers when by yourself. Mark and Dan had the outrigger setup which is basically an aluminum pole that stretches out 5 or 6 feet on each side of the canoe with an inflatable outrigger on each side, giving the canoe the stability needed. Once set up, off we went. Really cool! Right along with the wind pushing us we also paddled. Dan said with the right wind you could easily do 7 - 8 or more miles an hour and just sit back and relax. Our wind was not that strong or directly behind us, but with light paddling we were making 4 plus miles an hour. Man, could I've used this system when I did my Atlantic to Pacific journey, especially on the big waters of the Missouri and Columbia Rivers. I liken this to my bike portaging. Difference being, biking can be harder than paddling but you can cover more distance on a road than a winding river. We sailed right until 5:30 when Dan mentioned we should start looking for a campsite. I thought to myself, "Campsite? - It's 5:30 - Campsite at 5:30?" I usually start looking about 15 minutes before the sun goes down and then keep paddling because I figure there's a better one around the corner, so this is new territory for me. Dan pulled in at about 6:00 near Warren Dunes State Park. We'd come about 30 some miles which was a great day considering the wind we paddled against this morning. Although, I must admit as we each set up camp, I felt we should still be paddling. I could hear my dad now, "What are you doing stopping? You've only put in a half day's work!" Soon I settled down and found myself really enjoying being off the water and just plain relaxing. After supper we even built a campfire. I've never done this! Although, our time around the fire was short lived because we all were tired. As I lay in my tent I felt good. I was back on the water and paddling with three great guys. I was hoping in these last few days I'd learn a lot about paddling and these guys are as good as they come. In our first day together I've already learned a ton. Stopping at 6:00 - in bed without having to set up camp in the dark - campfire - Man, as Dan would say, "It doesn't get any better than this!" Sorry Dad, but I agree! Man, I was cold last night. I have a great sleeping bag (15 degree Feathered Friends) but I do not use a sleeping pad. Normally I have what's called a space blanket which is basically a small tarp with an aluminum coating on one side that does a good job blocking the cold of the ground from my sleeping bag. It fits perfectly inside my tent and on torrential rainy days keeps my tent totally waterproof. I've always put the tarp inside my tent. I found this to be better, for if you put it on the ground and then the tent on top, water can get between the tarp and the tent and you are one wet baby if that happens. I mentioned being cold to the guys in the morning and Toby said, "Maybe you should carry more than a hanky in your pack!" Hmmm, the give and take has started! To defend myself, I do travel light, which comes from hiking the Pacific Crest Trail where every ounce counts. Although my total pack weight, not counting food and water is about 20- 25 lbs I have all the essentials one needs. Although, I may rethink this after seeing all the comforts that Mark, Dan and Toby have. I wouldn't be surprised if they soon set up the TV satellite dish! Can you tell I'm having a good time? Anyway, the space blanket I forgot at home. It wouldn't feel right if I hadn't forgotten something. Just have to re-adjust this evening. This morning the wind again was coming from the southwest directly into our face. It was a fairly strong wind causing for some rough water and if the wind stays we will not make many miles. Fortunately it died down by around 10 and by noon the lake was quite calm making for a very easy day of paddling. Toby and I spent the day chasing each other. Not sure why, just two old guys pretending they were kids. Well at least one old guy and a supposedly one mature adult (Toby is only 58). Dan and Mark, by far the smarter, took their time and enjoyed the beautiful day. They didn't say anything to us, but I'm sure between the two of them there were some sly comments made about our actions. Again we camped at about 6:30 just past Michigan City. Heck, I must be getting old, yesterday I was wondering why so early, today I was looking forward to it. Besides we'd made another 30 miles and if all goes well, we will be in Chicago in a day and a half. In fact we can see the skyline of Chicago from our campsite. Really a picturesque site as the sun sets directly over Chicago. I have some nice pictures of it which will be posted soon along with rest of the pictures I've taken on this journey. Just another great day, paddling with 3 great guys. Time for bed. "Hey Toby, tomorrow I might let you pass me!" Just a gorgeous morning. In the 60's and a slight breeze. We were on the water by 7:30 - actually 6:30 for we are now in the Central Time Zone. Mark and Dan still go by Eastern Time. At about 11:00 we came to a spot on the lake where we needed to make a decision to either continue to follow the shoreline to the left or cut the corner to Gary, IN. Cutting the corner saves a good 10 miles of paddling. Did not take long for a decision. We are on our way to Gary, IN. Our aiming point is a steel mill we see 12 miles away. Crossing was very easy for the winds stayed calm. Only real excitement was when I was taking pictures of the many lake trout fishermen that fish these waters, Toby takes off. By the time I got back to paddling he was some distance in front. Dan must have been feeling a little spry this morning for he took off after him. I promised myself at the start it was going to be an easy day of paddling. Of course that went right out the window and off I went. After sometime I could see Dan right behind Toby, but Toby did not let up. He just kept going. When I reached Dan, he said, "Enough of this", and backed off. Of course I had to continue. Finally I caught Toby and paddled about half a canoe length behind him for a few minutes, thinking he'd slow down. He didn't, he just kept it going. I'd came to my senses and decided to wait for Dan and Mark. Later Toby stopped and joined us. I think Mark said something like, "Are you kids done now?!" For the rest of the day we all paddled together, reaching the steel mill in the early afternoon. We now had about 7 miles to go to Hammond, IN where we hoped to camp for the night. That would leave us about 12 miles to go to Chicago in the morning. Mike Smith, Dan's brother, has been helping us out the last few days by googling earth and seeking out possible camping spots for us. Dan would keep in touch by cell phone. Each day we'd decided on a camp spot and then change it at least twice. This was no exception, we must have called Mike at least 4 times. Each time we asked him to find something further ahead. Thanks, Mike for your patience and especially thanks for today's stopping point. We ended up at a state of the art marina in Hammond. Mike had made arrangements with the management telling them of our arrival. When we got there we were each handed a key that allowed us entry in and out of the marina, plus more important, the facility that had the nice warm showers! Great job, Mike. Along with the yacht club was a hugh casino, which meant a huge buffet. Nothing could be better unless one could win a couple of bucks at the casino. Mark, Dan and Toby were smart enough not to play. This Norwegien could not resist. Fortunately I only played for about a half hour and even walked out a couple of bucks ahead. That evening we set up camp on the Yacht Club lawn. Not a lot of conversation this evening. I think all of us have thoughts on finishing tomorrow and what's transpired since the start. My thoughts are with my brother who'd be 63 today. We lost him in a car accident in 1963 at the age of 16. Happy birthday, Don. Mark as usual was already up and had his tent down when I crawled out of mine. Normally Toby is up, but this morning he's still snug in his sleeping bag. Must be catching an extra wink because of the trains coming by every half hour last night. Dan likes his sleep and as usual was the last one up, but he's always ready to push off when it's time to go. We took our time this morning for we had less than 12 miles to go. Again the water was relatively calm with only a slight breeze coming from the southeast which for one of the few times will helped while we've been on Lake Michigan. For the last 2 1/2 days we've been able to see the skyline of Chicago. First with a dim veiw of the Sears building, then the beautiful sunset view of two days ago and now the whole city has jumped right out in front of us. Spectacular view from the water. Again, not much conversation for I'm sure my fellow paddlers have many thoughts going through their heads as I do. The last couple of days I've played back in my mind the many things that have transpired on this journey. All good. Even the bad weather days are good ones. What's jumped out most have been the people I've met. On all my journeys I've met so many nice people and this trip has been no exception. I think back to the beginning when Mel Herrera and Gloria Kelly treated us all to dinner the night before we pushed off. Then there was Ron Dean, Bryan Taylor and Chuck Amboy joining us for the first day of paddling. Bob Bradford, who'd I'd get to know better later was also there to see us off. I think back to how we all started off together only to find myself paddling with Jon until about noon and then by myself until these last three days. I had a blast during that time, fighting the current of the Huron, meeting so many people wondering what I was doing as I bike-portaged parts of Ann Arbor. My cross country trip from Dexter to the Grand River - a view that reminded me a lot of the farm country of my home state of Wisconsin. The start down the flooded Grand River, twisting and turning through a mass of trees, but for the first time going with the current. All good thoughts. Then came a very special meeting. I can still see Karen and Nancy escorting Karen's father, Jim Woodruff down to the water's edge when I was pulling into the Dimondale park. I've been looking forward to meeting Jim for it's been through his endless research of Hugh Heward's voyage in 1790 that we are retracing Heward's route from Detroit to Chicago. He'd been tracking all of us from the beginning with a running account of what we are doing and comparing it with the actual adventure of Hugh Heward. Just an amazing job . Now I had the honor of meeting the man. I remember introducing myself only to hear what sounded like my own father's direct way of talking telling me, "For gosh sakes man, what are you doing standing in that water with sandals on? Don't you realize you're in Michigan? Put some boots on!" (On my website at http://www.lhoff.com/ you can listen and see the entire conversation) That set the tone for a great evening and the beginning of friendships I will cherish from now on. I continued to paddle towards Chicago thinking of the many other people I've met, especially during the Hugh Heward 50 Mile Challenge. Chuck Amboy graciously inviting all of us for lunch at the English Inn in Dimondale the day before the challenge. This allowed me the chance to reunite with Toby, Dan, Mark, Charlie and Jon for the first time since Detroit. Then there was Mike Lehrer who took his time to show me the town of Portland. I was able to met both he and his wife again at the challenge. Great people. Mike even thought I was a halfway decent paddler. I remember being in awe of Bob Bradford when I learned he was using the same canoe he and his partner used in setting the record for paddling the length of the Mississippi. Janet, Bob's wife, an awesome paddler in her own right, would paddle with him on this challenge. His son, Mike and nephew paddled one of, if not the fastest, racing canoes in the challenge. There were so many others. Nancy Anderson comes to mind. She seems to be everywhere helping in any way she can. Scott Smith, one of Dan's brothers comes to mind. What a great day I had visiting with him and seeing his Superior Canoe Shop. For me, the 50-Mile Challenge was the number one highlight. For this was what the journey was all about - raising awareness and a few dollars for the Verlen Kruger Memorial. These group of people have worked hard at this project. Basically collecting a nickel at a time. No big sponsor, no big grants, no big money from the town treasury, just great people honoring a man that's meant so much to them. I never got to meet Verlen, but I feel I know him well. Anyone that enjoys the outdoors and dreams can truly appreciate a person like Verlen Kruger who lived his dream to the fullest. So I hope my little journal and blog may help in seeing the dream of Verlen's friends come true in the near future. Some out there may also like to see it come true, if so I hope you take the time to look at the Verlen Kruger Memorial website http://www.verlenkrugermemorial.org/ and possibly buy a brick. You can go directly to the brick order form here: www.verlenkrugermemorial.org/id27.html. We are now very close to the end of this adventure and I'd like to comment on the three men that allowed me to finish this trip with them. Toby Nipper is 58 years old from Florida. He's only been paddling for two years. Back then he entered a canoe race on the gulf of Florida and promised himself if he finished the race he'd never go back to work. He finished and he's not been back to work since. In fact in a few days he will be off on another trip. By the way, he will give anyone a run for their money in a canoe. I believe we've become pretty good friends in the last few days and I hope to paddle with him again. 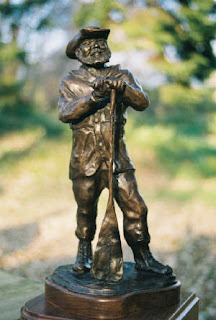 Maybe some day in the Boundary Waters with a couple of my outlaw friends! Mark Predwojewski is 39 years old from Irons, MI. As mentioneded before Mark has taken over Verlen's canoe business and is the person I bought my Kruger canoe from. He reminds me a lot of my son Eric. Eric is a talented artist who is very particular in what he does. Mark's craftmanship is very much the same. He also has a little of our son Dean in him. Dean is easy- going, nothing bothers him and that has been true with Mark. How he's put up with these three old men is beyond me. But, he's done an outstanding job babysitting us! Just a class act and world class paddler. Dan Smith is also 58 years old from Portland, MI. The past three days he's shared a number of good times he and Verlen have had over the years. One being canoeing the Yukon River. I've come to believe no one misses Verlen more than Dan. Dan's a driving force behind the memorial and he will see it through. No one more than Dan wants to paddle the Grand River and look over and see the watchful eyes of Verlen. Dan, I know your efforts are sincerely appreciated by all. Then there's Jim Woodruff, the self-named "Topologist" for this journey. If you have not read his blog you are really missing something. He's a special man with a gift for writing, although his daughter and son must censor his pen once in awhile. If you haven't read his blog click on the following: http://www.thetopologist.blogspot.com/ It's a must read. We've arrived. No fanfare other than Mike Smith and his girlfriend here to greet us. Mike will be shuttling Toby, Dan and Mark back to Michigan. My friend Jim McIntyre will be here soon to take me home. Can not thank Jim enough. He's been a trooper once again. Before everyone packs up we will paddle a mile to the Chicago River. Dan, Mark, Toby, Mike Smith and his girlfriend will paddle down the river for a mile or two. I will not, for Jim will be here soon and I do not want him waiting around for another 2 or 3 hours. So I said my goodbyes to some very special friends and headed home. Mr. Topologist my friend, your "cat herding" is complete. You now are free to harass someone else!